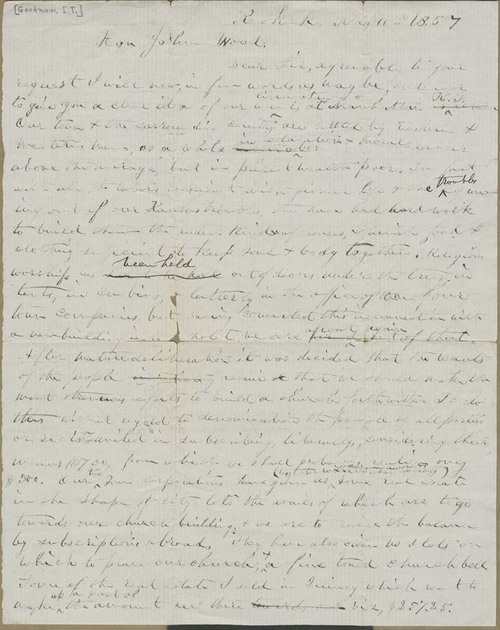 Isaac Goodnow writes from Keokuk, Iowa, to John Wood, promoting another addition, a non-denominational church, to the town of Manhattan, Kansas Territory. As he was appointed an Agent by the church Trustees, Goodnow is now soliciting support for the construction of a church, as well as a college, in Manhattan. He also alludes to the living conditions in Kansas Territory as"education & morals rather above average, but in present wealth poor."